Christmas is one of our favourite times of year, and once you’ve got kids, suddenly it feels fine to act like a child again. Present shopping brings with it a positive yelp of joy, as opposed to a begrudged sigh, and everyone wants to be at your house this year. A baby’s first Christmas is always a big deal, after all. You’ve shopped ’til you dropped and have re-started all the family festive traditions. New PJs for Christmas Eve, stockings hanging on the fireplace, Father Christmas’ annual visit… It’s all VERY exciting – but remember when you bring baby George down to open his brand new, cuter-than-cute stocking, he won’t actually be able to open it, or have any idea what the hell it is. You’ll be doing all that yourself. And do not let him eat the Brazil nuts you stuffed in the bottom with the satsuma – it’s unlikely his teeth will cope. 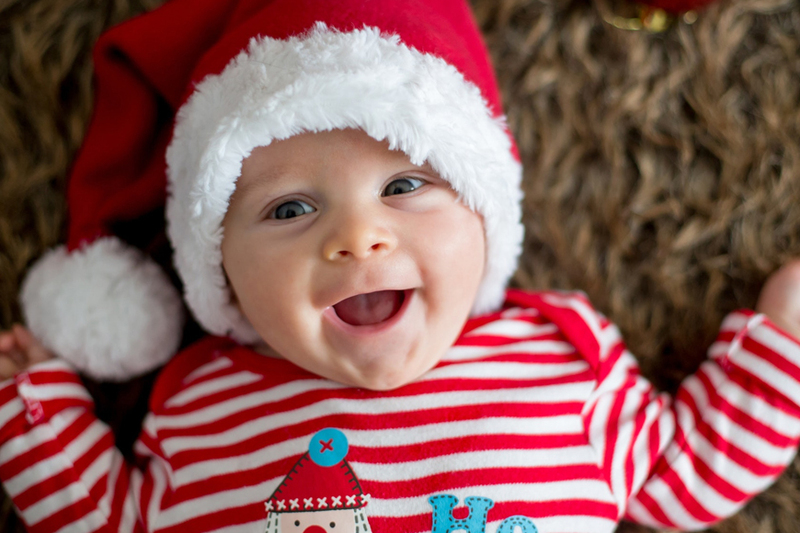 As you move on to the presents under the tree, your bouncing bundle of joy keeps looking at you like you’re insane. What exactly is all this stuff? Prepare yourself for nonchalant facial feedback, but if you really need a reaction, the wrapping paper is where it’s at. Especially if it’s bright and shiny. Hand it over and get ready for a squeal of delight. So, on realising that your little love couldn’t give two hoots about any of the things you spent hours wrapping up, you make a mental note to be more sensible next year. Buying practical items – i.e. boring stuff they genuinely need – is the way to go for the first few Christmases. Tying in with everyone wanting to come over for baby’s first Crimbo, your under-tree present stash has never looked so bountiful. The grandparents tend to be the worst offenders, turning up laden with gifts, but loads of your friends – and even family and neighbours you’ve not seen for yonks – seem to want to give you a pressie for the littl’un. Once babies have mastered a tiny bit of hand-eye coordination, those low-hanging decs on the tree have never looked so attractive. They’ll muster up all their might to crawl and bum-shuffle across the floor in order to grab them and see what they taste like. Cue genuine tree-falling danger, which is going to make the whole family cry. We all remember those days when we’d wake up at the crack of dawn and head into our parents’ bedroom on Christmas morning. It’s always too early, but IT’S CHRISTMAS! How on earth are we meant to be able to get back to sleep now? Babies are blissfully unaware of this, of course. But it’ll all act as good training, as they’re bound to wake up in the small hours anyway, ready and raring to start the day. When you’ve been up since 4.45am on Christmas morning, 10am almost definitely feels like lunchtime. Therefore, it’s a perfectly acceptable time to crack open that bottle of warming mulled wine and start drinking. Mmmmm. Back in the day, you’d snigger at the ‘old folk’ snoozing on the sofa after eating and drinking their body weight in Christmas fare. As a parent, however, that afternoon nap is now a necessity. And even better: Because it’s highly likely you’re in your very own pad, you can swap that armchair shut-eye for an actual proper lie down in your bed. Beware – you might need someone to come and wake you, or it’s likely you’ll sleep all the way through the rest of the day, but it’s a well-deserved little treat. And it gets you away from Great Aunty Nora for five minutes. Again, babies don’t understand the big deal that is Christmas dinner. They’re bemused by the masses of people constantly in their face, and with all the madness, are highly unlikely to have a quiet play for you, whilst the whole family squeezes around the table to eat for three hours. You might even find that’s the time your mini-me decides to be the most fractious. So, rather than letting you graze and guzzle, they’d very much like to perch on your lap and be constantly cuddled – ideally with both arms, please. It’s OK – Christmas dinner tastes just as good reheated in the microwave, right?